Culture from where by whom and for whose benefit? I watched the story of Inikpi as executed by Segun Arinze and others while preparing for a wedding in my hotel room and it brought tears to my eyes. Segun Arinze spoke my language (Igala) so well and I was proud to be an Igala. What was moving was for me to see Inikpi submit herself to be sacrificed readily when the gods chose her to do so to forestall a looming danger. Equally depressing was that other slaves had to be buried alive with her. This is no news right? We do not question anything in Nigeria, the people in the days of yore as well as now. What came to mind over and over again when Segun Arinze asked the priest to ask the gods for a second time was that, suppose the priest was begrudging the Attah and needed to use Inikpi to settle accounts with the Attah? How anyone could have known bothered me all day. Oh! Those innocent slaves went into the gibbets like lambs to the slaughter to be buried alive, resigned to fate, they never complained. These were other people’s children with every right to their lives. Same thing happen in lots of places in our day, when crowned heads die it is alleged that many people in communities vote with their feet else some may go the way the slaves went with Inikpi. Sovereigns never go alone, although they came alone. I hear that broadcasts of demise are saved now for a later moment so that the ‘needful’ can be done and not earlier. Religious bodies and governments are tight-lipped, do not even talk about them, and never preach against them. It has to be in Chinese whispers. Masquerades have dealt women fatal blows. Women are not to see them at certain periods, and those who run into them are beaten and they run for their lives showing ugly faces after receiving life threatening blows. Stories abound, never apocryphal of people beheaded because they ran into a masquerade dance at times they aren’t supposed to come out of their houses (especially at night) and these heads are brandished on rods by the masqueraders with zest. 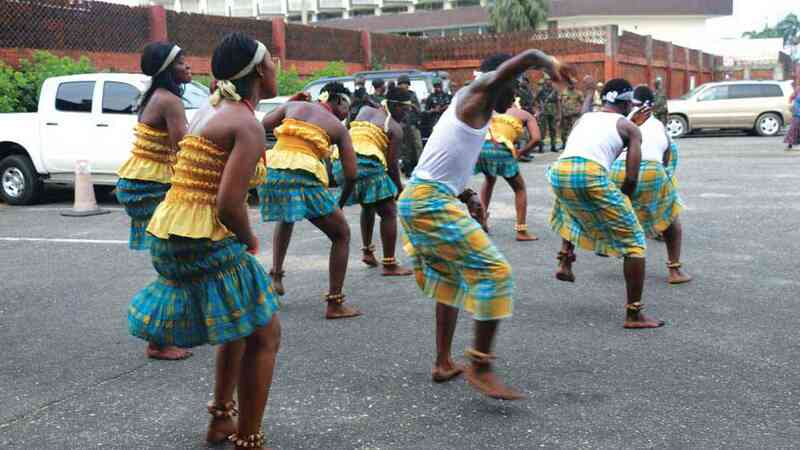 How have these dances helped Nigeria? Government even help to broadcast these disorder for it is on government and private radio stations that people are advised not to come out at certain periods of the day because of masquerade parade. Man-eating is still being practiced in some places in Nigeria, disgustingly many people say it is cultural and in these communities’ many unsuspicious guests have been tricked to the gallows-tree. cultural? I knew Emeka although from a distance as a hardworking young man. He was a civil servant and that he lived with a woman. I thought they were married. You would think so because the mother of the lady and her other children stopped over many times to scrounge on him. Whatever he ate, they ate also and they leave with cellophane bags containing food items. It is not easy taking care of an entire family especially in a country where what people earn is not within the threshold to spare. Then calamity struck. Emeka and his pregnant wife (so we thought) had a ghastly accident in his vehicle. The car was destroyed beyond repair and the lady died on the spot. Emeka as a result of the accident could not walk and work again on both legs without the use of crutches and he had metals wired into his body. This once agile fellow, life indeed is not a pedestrian walk-way. His employers though were high-minded enough to allow his name on the payroll. Even before he was discharged from the hospital, the family of the lady started drumming. “You lived with our daughter for three years without paying her bride-price.” The chief campaigner was the mother of the girl who was the chief scrounger on Emeka before the accident.”You have to marry her properly, pay her bride price before we accept her body for burial.” But where were these people when the lady co-habited for three years with Emeka or is shacking up without doing the needful cultural? Didn’t many of the families visit them at the time and gave vent to their union. I wonder why they exculpated themselves from any wrongdoing. On his way to the hospital for an inspection years later, Emeka and his new consort (now pregnant) had an accident. Amazingly, only two of them died on the spot. Some people resolutely accused the woman for using voodoo to eliminate them. I am no voodoo expert but couldn’t the voodoo man have known that Emeka was a good man and chosen not to venture on the deathly assignment if he was actually asked to do so? Are our gods only interested in destruction and not growth and development? Don’t the gods know right from wrong anymore and must only talk at chosen times when good crosses the Rubicon to wrong and life must be involved? I look at the innocent children begging with bowls on the streets in the north and I wonder when this will end. At a stopover in Suleja a moment ago and in a restaurant at Morocco road, they stood at the door eye-balling diners. I was so uncomfortable. This isn’t new to me, for I have seen that over and over again in the whole north. What angers me is that it has become a culture tolerated by the whole society but for whose benefit? Their parents have handed over responsibility but yet they must raise many other children they can’t take care of leaving their destinies in the hands of diners who can manage to give only a nickel. Do we mean well to tackle the fight against insurgency and social disorder with ready foot soldiers as these everywhere in the north?